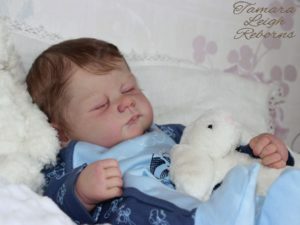 This cute preemie reborn doll is currently for sale on ebay. Made using a sold out LLE kit, you do not want to miss this rare chance to own your own. No detail was overlooked with sweet Rosie! From her lovely painted hair down to her tipped fingernails and toenails! She is the hard to find SOLD OUT Limited Edition sculpt by Laura Lee Eagles. Her blank kit alone goes for quite a bit! 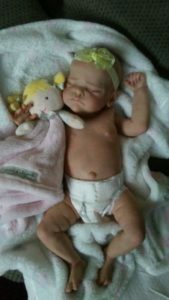 Sweet Rosie was brought to “life” by Suzanne Ball of Monday’s Child Nursery. 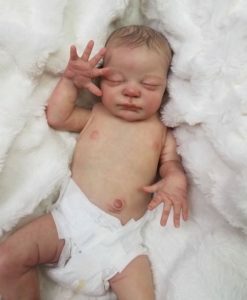 She is 15″ long and weighs 3.4 lbs. 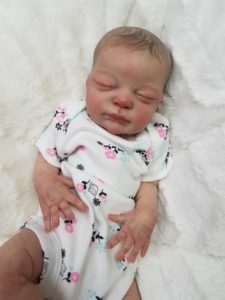 Rosie was painted with Genesis heat set paints and has very lifelike features such as veining, mottling and blushing. She is sealed with a matte varnish to protect her paint. 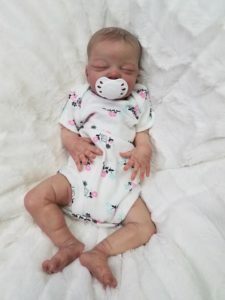 Rosie wears Preemie or small Newborn clothing. She has full vinyl limbs on a weighted doe suede body. 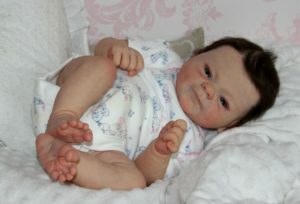 Her head is also weighted and must be supported when you pick her up, just as you would with a real infant. 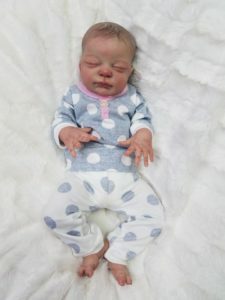 Rosie will come home with her gender neutral vinyl tummy plate, magnetic pacifier, 3 outfits, stuffed animal companion, 2 diapers and a blanket. Comes from a smoke free adult-owned collection.